Heat the olive oil in a large non-stick pan or enameled cast-iron dutch oven. Season the beef on each side with salt and pepper. After a few minutes, add the beef to the pan and sear on each side; only 4-5 minutes on each side. Remove from pan and place into a shallow baking dish or casserole dish. Note: Cooking all of the vegetables may seem overwhelming but it really does not take much time at all and all of the vegetables use the same ingredients. You can also use the same pot for each vegetable. Simply drain the water and quickly rinse out. Boil a pot of water on the stove. Once boiling, add the bean sprouts and cook for only 3-4 minutes only. You want the bean sprouts to be tender but still slightly crunchy and not too soft. Remove from pot (drain water) and season with a dash or two of sesame oil, a pinch of salt and some minced garlic. Taste and adjust ingredients as needed. Sprinkle with sesame seeds, mix and set aside. Boil a pot of water on the stove. Once boiling, add the chopped kale and cook for only 3-4 minutes only. Remove from pot (drain water), squeeze kale a few times to release all the water and season with a big dash or two of sesame oil, a pinch of salt, a teaspoon of soy sauce and some minced garlic. Taste and adjust ingredients as needed. Sprinkle with sesame seeds, mix and set aside. Heat 1-2 tablespoons of sesame oil in a large non-stick pan or wok. Once heated, add the zucchini and sauté for a couple minutes. Season with salt and cook for another 1-2 minutes. Remove from heat and set aside. Heat 1-2 tablespoons of sesame oil in a large non-stick pan or wok. Once heated, add the sliced shiitake mushrooms and sauté for a few minutes. Season with salt, a splash or 2 of soy sauce and the 1/2 teaspoon of sugar. Cook for another 3-4 minutes or until mushrooms are cooked and tender. Heat 1 tablespoon of sesame oil in a large non-stick pan or wok. Once heated, add the carrots and sauté for 2-3 minutes only. The carrots don’t need any seasoning as they are already slightly sweet and will be mixed in with everything else in the bibimbap. Remove from heat and set aside. To prepare the gochujang: Mix the hot pepper paste, honey and sesame oil together and set aside. Sprinkle with sesame seeds if desired. 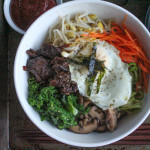 To serve the bibimbap: Place the brown rice in each serving bowl and place each vegetable topping and the slow cooked beef on top of the rice, around the edge of the bowl. Top with the cooked egg and garnish with the gim and sprinkle on some roasted sesame seeds. Serve with the gochujang (and additional sesame oil if desired) at the table. Mix in as little or as much gochujang as you like. Enjoy!